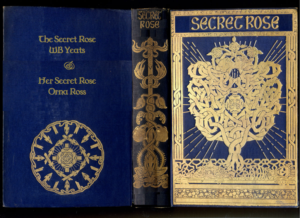 Orna Ross’s crowdfunding project: Secret Rose: A two-in-one book tribute in replica of an 1897 first edition. I do understand the mindset of those who are wary of crowdfunding. Before I embarked on my own project, I was a little suspicious too. But I dearly wanted to create a book that was too expensive to risk upfront investment: to include my novel about the love story behind a book of stories by the great Irish poet, WB Yeats, together with his book — and all in replica of his 1897 first edition. 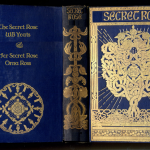 This meant special paper, special binding, intricate gilt impressed cover (see left) and other lovely details that were beyond the budget of an indie author. What I didn’t expect was to find that the crowdfunding experience, in itself, would be so rewarding and thought-provoking. It has made me think deeply about the gifts of writing and reading, about the power dynamics of giving and receiving, and about how it feels to make ourselves vulnerable by asking for help. It took me out of the world of consumer exchange into the gift economy of creative exchange. In every society, a gift economy operates parallel to the consumer economy, though often disrespected and misconstrued by those whose main focus is the bottom line. What differentiates the gift economy is that even when money is involved, it is not the primary objective of the exchange. Writers and artists have always operated within this economy. In recent years, skill-sharing, open-source coding, time banks and WikiLeaks are just some of the ways we see the gift economy in action. And in the publishing space: free book giveaways and crowdfunding. 1. Crowdfunding and The Art of Asking and Receiving. Like breathing in and out, both giving and receiving are needed to keep creative flow (and money exchange) moving freely. It would be ridiculous to label inhalation “better” or “worse” than exhalation but in our culture, giving is generally viewed as honorable and praiseworthy, while taking is a bit suspect. Nobody has explained better than Amanda Palmer how asking for help, and allowing another person to give to us, makes us feel vulnerable. In that vulnerability is the creative and human connection, she explains in The Art of Asking, where she shares with open, almost brutal, honesty how her life has been a willed unfolding of trust in the process of opening up to that vulnerability. Palmer, a musician, flings herself off stages and into the crowd and trusts that they won’t drop her. She also tours the world asking Twitter for somewhere to crash for the night, showing up alone at people’s homes in the middle of the night. “Couch surfing and crowd surfing are basically the same thing,” she says in her Ted Talk, well worth watching if you haven’t. Trade publishing, with fixed pricing and copyright, tries to make readers pay the price it sets for books. Crowdfunding is part of a new wave of that allows readers to pay what they feel the book is worth to them. When you set up a crowdfunding project, you are asking not for a charge, nor for a donation. You are asking for support. And in return, you are offering rewards. In the offer, you give people an opportunity to become involved with your project, to get close to the creative enterprise. Lots of readers experience this not as a cheeky request but as an opportunity. Half way through my crowdfunding project, I can already say it’s brought me so much. It’s similar to the daily author-to-author exchanges we witness in ALLi but with crowdfunding, it’s author-to-reader and reader-to-author exchange. But both share the same empowering sense of support, camaraderie and understanding. Even if the project doesn’t meet its target, I’m making new friends and learning all sorts of new and wonderful things about Yeats, about his and my readers and, yes, about myself. I’ve realised that crowdfunding itself is a creative connection, just as much as the book it will hopefully help to produce. If you’d like to support my campaign to resuscitate the forgotten stories of WB Yeats and make them available in a very special edition, you’ll find details over on Pubslush (an ALLi Partner and platform for literary projects). Seeing the dates of previous comments and the article itself, I think it’s safe to say crowdfunding has gained momentum and social acceptance in the past 2+ years. Personally I have 40 years experience volunteering with non-profits, including fund-raising, and founded an educational non-profit in 1998 that today is going strong. I appreciate the motto, “If you don’t ask, the answer is always ‘no’.” For all writers and artists bold enough to crowdfund, I applaud you! I’ve just joined Alli, with my prime interest being to find out more about crowdfunding and marketing. The articles I’ve read here were an eyeopener, and somewhat surprising that some people see crowdfunding as ‘begging’. But on the whole, more positive than negative, which encourages me to try and move forward with my own campaign. But I’m completely in the dark on how to start it! I’m a self-published author of two sci/fi fantasy novels with a third near completion. Plus ‘How I Wrote My First Novel’; written because so many people asked me how I took up writing so late in life! I’ve had modest sales, but very encouraging responses from those who have bought and read the books. I now want to take the new novel to another level and I think crowdfunding will do this, involving old and new readers. Which crowdfunding company to go with – Publishizer, Kickstarter etc.? How do I calculate a realistic amount of money and rewards for same? If this amount/target isn’t raised, what happen to the amounts subscribed? Is it refunded? And, no doubt, there are many more questions that will be raised – so, HELP. Incidentally, I notice that most of the articles date back to 2015; are there any that are more recent? I think it depends on the goal of the crowdfunding endeavor. Some crowdfunding that I’ve seen only benefits the individual running it. Asking for money to make a trip to an Olympic lifting competition (this person’s dream) still seems like begging to me. Why not budget and do it on your own? There’s the lady whose daughter jumped off the roof and broke her ankles (all on video), asking for help paying medical expenses. On the other hand, I’m sure all beggars aren’t asking for help for selfish reasons. Maybe both should be shameful, or maybe neither. Maybe each should be judged individually. I wouldn’t write an article saying it’s not begging though. 1 The project is most important. It has to be a book that people want to read. If they know you, so much the better. But it has to be something that they believe absolutely must be created. 2. Your supporters/backers/investors become your street team. They will tell others that they are supporting this project. It should have a ripple effect for support and later, readers. 3. Spectacular incentives/gifts are less important than their faith in you. The most obvious thing is, of course, a copy of the book. My supporters will get either ebook or print – or both if they’d like. They will be thanked in the back of the book as well as on Facebook, Twitter and on my website. All will be invited to the book launch in 2017 (two locations committed already to host it, believe it or not). 4. I have a bonus incentive. Thanks to a partnership with NY Foundation for the Arts, all contributions are tax-deductible. We’ll see if that’s a big draw. I go into this with great trepidation. But I go into it much more confident than I was two months ago. That’s when I put out the word that I needed help with research, and the offers started pouring in. I expect some of them will contribute to the crowdfunding campaign. Knowing there are people out there already who are excited about a book I won’t start writing for months gives me hope. I am new to the alliance. I have been thinking of Indiegogo crowdfunding for my book when it comes back from the Copyright office in Wasington, D.C. I had the pleaure of meeting one of the execs at Indiegogo. My problem with using crowdfunding is you only have one chance to do it right and I don’t want to make a mistake. I want to create my own publishing company, have someone (can’t find who yet) print the pages, and the cover, get an ISBN # and promote, distribute and the travel tour for the book. I am not sure the exact total. Could be $10,000. could less or more. How do I find the exact total to ask for? Do I need to submit an exact accounting of each item I need. I was told to ask friends and relatives first, but if you don’t have those people to ask, the complete total needs to come from crowdfunding. I am nervous I’ll make a fool out of myself and not do it right. Then the next project will not be taken seriously because I screwed up this project. I also don’t know what to give them as gifts, other than signed copies of the book, and perhaps mention in the book. Any and all info would be greatly appreciated. I am stumped and not moving forward for fear of doing the wrong thing. I ran a crowdfunding campaign two years ago, partly to raise finance and partly to test the market. I do think it is really important that the rewards offer value and relevance to the pledgers. So many campaigns fail yet because the successful ones get so much pr, people tend to think it easy. What I found was that so many people were excited to be part of the journey, they felt like they were part of it which made it hugely exciting. Thanks for your well considered article. I have run 3 of my own projects with Kickstarter, plus written/helped with half a dozen others. I agree totally with your premise that there is more than getting money to do a project, that makes crowdfunding so powerful. I’ve done 1 fine art project, plus 2 for books, all successful. The process is not for the fainthearted for sure! Getting past the fear of asking for help was a big one, but I think the process was really good for me. I think I gave good value to my contributors, and finished on time or early in most cases. One of the things that amazed me most, were the supporters that gave donations with no request of one of the rewards. A million blessings to be heaped upon them! I have definitely found some solid, ongoing community with many of my supporters, and they continue to support other non-CF projects of mine. Thanks again for adding your voice on this issue. Great post, Orna. I work for a charity, so I am used to asking for money in many ways, whether it is for discounts on some Finnish consumer products to our members, or just cash up front for a project. What I have come to understand, however, is that rather like crowdfunding, this is not asking for money, but asking for co-operation: in this case the funders provide the cash, and you provide the book they wish to see published. Like in any commercial transaction, there has to be a good offering and a reasonable (or acceptable) payment. Just a different kind of way of selling your book. None of us indies, or non-indies for that matter, consider it begging when we offer our books for sale, now do we? Small detail, indeed! Good luck with that! 🙂 And thanks so much for your insights from the charity perspective, Helena. I like the concept of asking for cooperation. Cooperation and collaboration is feeding so much of the indie author movement — and the wider creative upsurge we’re all living in. What an interesting and inspiring article, Orna! I first heard of crowdfunding a little over a year ago, when I stumbled across mention on twitter about a science-fiction film/audio series – the creators were looking for crowd-funding. I pledged a fairly small amount, being cautious, and was able to follow the progress of the production. When the first trailer and audio series was released, it was an amazing feeling to know that my small contribution, along with that of many others, had helped it happen. I’ve since donated to three more productions in a small way, each equally rewarding, and am now working on my own pitch to produce a book trailer for my first novel by crowd-funding. Like you, I’ve found it an enriching experience – I’ve met -and will no doubt continue to meet- some lovely, talented and interesting people. I have discovered skills I never knew I had, and the knowledge that I am -in a small way- giving other people work and opportunities is a marvellous feeling. I wouldn’t say, in hindsight, that crowd-funding is begging at all – it is a reciprocal process which enables individuals to stretch their wings, and is incredibly enriching. I think it’s wonderful! Best of luck with your project, I hope it succeeds! Thank you so much, Elaine, and thank you also for the repost! 🙂 I’m so glad you found contributing to a crowdfunding project such a positive and inspiring experience. That’s what I hope to bring to my supporters too, lots of details of the book being made, the design and production process, so they can enjoy the experience of having helped to make it happen. Crowdfunding tends to work for those with a following. 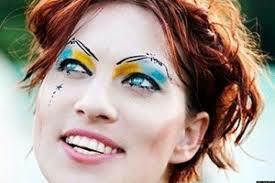 Amanda Palmer being married to famous author kind of helps, which is why I do not think she is a very good example. For authors starting out, crowd funding might not be that successful. Still, I think it is a great idea. Even if the funding does not come through, you have a chance to expand your audience. It is a type of promotion and advertising. but you also need a backup plan if it does fall though. You’re right about Amanda being married to Neil Gaiman can’t hurt… but I think what she has to say transcends that — and I believe, precedes it. The back up plan is to probably to actually beg or borrow (draw the line at stealing!). The more it goes on, the more determined I am to make this book. Thanks for commenting, William! This is how I’ve always thought of crowdfunding, and I’ve always been surprised when other people have such a negative reaction to it. People who crowdfund aren’t begging, they’re offering goods or services in exchange for money. It’s like pre-ordering with bonuses for the customers! I think the point that you made about crowdfunding being an opportunity for fans to become involved with your creative project is the most important. 🙂 Lots of awesome things have been crowdfunded, the Lord of the Rings Trilogy, for example, and I bet all those people loved seeing their names in the credits! They didn’t feel taken advantage of. They felt a part of something bigger than them! Thanks again for writing this. I’ll be pointing some of my writer friends in this direction! I completely agree, Elanor (now!). I think writers probably angst over the idea more than other creatives… Thanks so much for pointing the way! Thanks for putting crowdfunding for authors in the positive light it deserves. I’m looking forward to staging my own campaign. good luck with it Flora and let us know about your project, won’t you? I’ve always been miffed by this myth that crowdfunding is “begging for money.” First of all, no one is out there panhandling for change, nor harassing people to contribute money to their cause (unlike, say, the annoying buggers from Greenpeace who are always outside my grocery store). Secondly, there are always perks – part of the “gift economy” you mentioned – so it’s really a kind of patronage. You give something, you get something. But mostly, I have to wonder why people view asking for a contribution to the creation of an artistic project as wrong or bad. I mean, how is it really any different than, say, an NPR funding drive? When you give money to NPR, you help them create new content – and that’s exactly what crowdfunding does, except you get to know the artist producing the content even more intimately. Seems like a good thing to me! Thanks Laura and yes, I agree. I think maybe it arises from this notion that the arts are a frivolity, a sort of icing on the cake of life, rather than the necessity they are. Thanks for reading! Gosh, that’s such an interesting take on crowd-funding – I’d never thought of it before as being in some senses the equivalent to asking people to pay what the project is worth to them. I’m really glad you wrote this post, Orna, which will encourage more people to take that route where appropriate. Thanks Debbie, and thank you so much for your support!